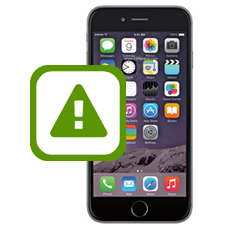 Repair of iTunes iPhone 6 error codes is an area our in-house iPhone technicians have a vast experience with. We can correct and repair many of the common iTunes error codes and resolve many of the more unusual iTunes error codes. These are usually displayed during an iTunes firmware upgrade or firmware restore on the iPhone 6. If iTunes does display one of these specific error codes we can usually fix the issue, below is a list of common iTunes error codes we can fix for you. We repair iTunes errors for the following iTunes error codes iPhone 6 error code 14, iPhone 6 error code 9, iPhone 6 error code 1, iPhone 6 error code 40, iPhone 6 error code 17, iPhone 6 error code 3. Please note if the exact error code is not listed above we can still in the majority of cases fix the issue on your iPhone 6. * Our normal repair turnaround times are 3 - 5 working days. We always aim to complete repairs as fast as possible. This is an in-house Apple iPhone 6 repair service, when ordering this service you are required to ship your iPhone into our repair centre for works to be undertaken. We have repaired this error code in the past, with software faults we deal with them on a per unit basis, however if we can not fix your iPhone you would be refunded less return shipping costs. We have a high success rate with error code repairs on the iPhone 6, please feel free to send the iPhone 6 into us for error code repairs. If we are unable to repair your iPhone 6 you would not be charged.